Greetings fellow Mystic Mountain journeymen. I would like to take this opportunity to thank all of my subscribers for their continued support. It fills my heart with joy to read the comments and see that you have “liked” one of my post. Much appreciation. This post is to inform you all of an event I will be performing at on April 1, 2012 in San Francisco. 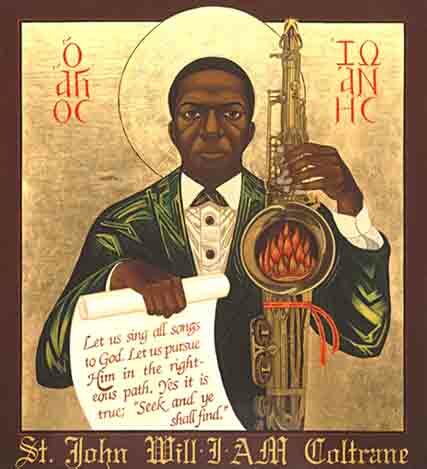 As many of you know I am a lifelong member of the St. John Coltrane African Orthodox Church (aka Coltrane Church), and as a member and follower of Coltrane Consciousness I have had the awesome experience of understanding the magnificent power of Coltrane’s music as well as study the intention of the man John Coltrane. It has truly shaped my life and my mission on this planet. As you can tell by my poetry Coltrane runs deep. So I invite you to attend this benefit concert on April 1st and hear me sing to Coltrane compositions and recite Coltrane influenced poetry. All ticket sales go to support the St. John Coltrane Church and are tax deductible. And even if you cannot attend please consider giving a donation to support this great work that has been teaching about the spiritual power of Coltrane’s music for more than 43 years. Please visit www.coltranechurch.org to purchase tickets, donate, or learn more about the church. The event takes place on Sunday April 1 and will include speakers, performance from noted jazz musicians and vocalist, tap dancers and spoken word artists. The program will begin at 5pm with performances from the Coltrane Church Ensemble and The Voices of Compassion featuring the vocal talents of legendary jazz singer Ann Mack, renowned saxophonist Azar Lawrence, celebrated jazz drummer E. W. Wainwright, spoken word artist Marlee-I Mystic, and tap dance percussionists Toes Tiranoff and Megan Haungs. 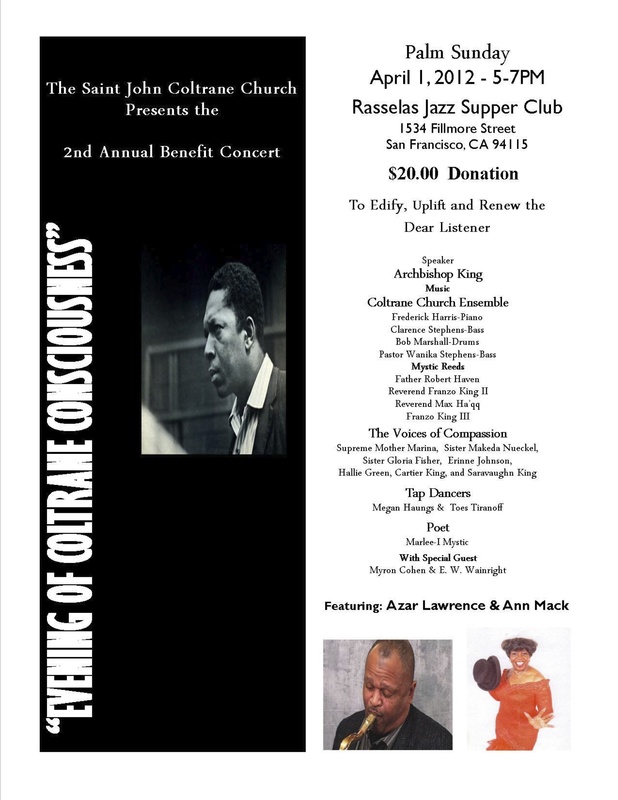 The event takes place at Rasselas Jazz & Supper Club, 1534 Fillmore Street in San Francisco. $20 donation for the event. Get you tickets in advance at www.coltranechurch.org click on donation and make your purchase, print and bring proof of purchase. The Saint John African Orthodox Church has been a force for good in the community for the past 43 years. Founders Archbishop Franzo Wayne King and Reverend Mother Marina King began their work in 1971 under the name of “One Mind Temple Evolutionary Transitional Body of Christ.” The inspiration came after the young couple had seen John Coltrane perform live in San Francisco in the year 1965. Being raised in the Pentecostal Church, Franzo King knew the presence of the Lord, and experienced this presence in the sound of John Coltrane. Archbishop King refers to this as a “sound baptism” which touched their hearts and minds. In 1982, the church was incorporated into the African Orthodox Church, which was founded in 1921, a time when people of color who were excluded from advancement in the Episcopal church Its founder, George Alexander McGuire, sought to draw a wider circle that includes all people in the quest for ecclesiastical and spiritual freedom. The Saint John Coltrane African Orthodox Church is located at 1286 Fillmore Street, between Turk and Eddy, in San Francisco. Visitors from throughout the world attend the weekly Coltrane Liturgy, celebrated every Sunday from noon to 2pm. All are welcome. This entry was posted in Monologues of my mind and tagged A Love Supreme, Ann Mack, Azar Lawrence, Benefit Concert, coltrane, Coltrane Church, Coltrane Consciousness, Concert, E. W. Wainwright, jazz, marketing, music, Myron Cohen, Performances, poetry, Raseela's Jazz Club, San Francisco, spirituality, St. John Coltrane AOC. Bookmark the permalink.